What is a Blue Bond? 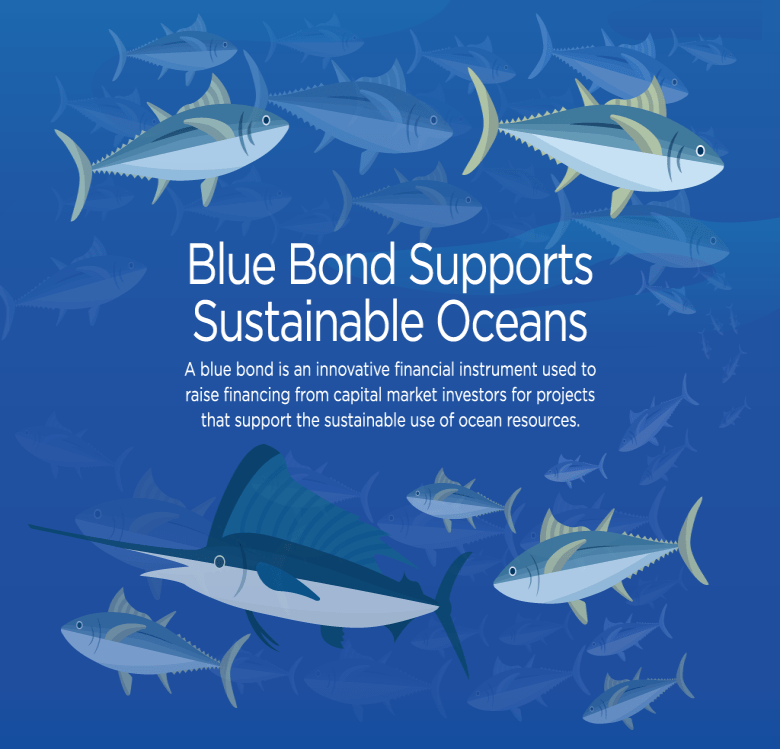 to raise capital from impact investors to finance marine and ocean-based projects that have positive environmental, economic and climate benefits. The blue bond is inspired by the green bond concept, which people are more familiar with. Why did Seychelles decide to issue a Blue Bond? Like many small island states, Seychelles’ economy is highly dependent on the ocean and on fisheries for food, nutrition and livelihoods; marine habitats, and other blue economy sectors such as tourism. After tourism, the fisheries sector is the country’s most important industry, contributing significantly to annual GDP and employing 17% of the population. Fish products make up around 95% of the total value of domestic exports. Assignment Description: IFC is seeking a consulting firm in: (i) improving the regulatory and administrative framework for the management of environmental risks in the selected sectors in a way that will enhance the competitiveness of the industries; (ii) strengthening waste management systems including exploring opportunities for recycling and reuse; (iii) explore and develop opportunities for efficient use of resources; and (iv) build institutional capacity to implement, manage and regulate environmental sustainability systems (aligning with Eco-Industrial Park Framework). Had you looked across Shanghai’s Huangpu River from west to east in the 1980s, you would mostly have seen farmland dotted with a few scattered buildings. At the time, it was unimaginable that East Shanghai, or Pudong, would one day become a global financial centre; that its futuristic skyline, sleek expressways, and rapid trains would one day be showcased in blockbusters like James Bond and Mission Impossible movies! It was also unimaginable that the Shanghainese would consider living in Pudong. How wrong that would have been! Pudong is now hosting some of the world’s most productive companies, and boosting some of the city’s most desirable neighbourhoods. And Shanghai has become China’s most important global city, lifting the entire hinterland with it. The World Bank ECA Water team is considering different options to support client countries in the development of special financing facilities for water utilities, with a focus on facilities extending targeted lending to utilities for increasing their operational efficiency directly impacting their financial situation. A regional, multi-country or national financing facility would aim to achieve the following objectives: i) provide financing for small investments resulting in efficiency improvements which can contribute to achieving long term sustainability of WSS services; ii) improve cost recovery and financial sustainability and utility creditworthiness; and iii) contribute to building up a commercial banking market for WSS utility lending by developing the skills of commercial banks to take municipal/utility risk. See attached TOR for further details. The Firm to be selected will undertake a feasibility study to support the design of such financing facility. Objective: The assignment is intended to be undertaken by a very experienced and high-quality firm (or a consortia), familiar with undertaking assessments of this type, both in the region and internationally. The Consultant will be expected to provide approximately 10-person months of key staff inputs. The estimate of the key person requirements is only indicative and could be construed as skill mix requirements for these services. The contract for this assignment will be a lump sum contract, administered by the World Bank. Objective: IFC and Bonsucro are interested to undertake a business case assessment for Bonsucro sustainability standard and improvement framework for sugar mills and smallholder value chains in India. In the 1960s, the vision of future mobility was people with jet packs and flying cars – we believed these innovations wouldn’t be far off after the moon landing in 1969. Obviously, the reality in 2017 is somewhat different. Today, we have congestion in cities, rural areas cut off from the rest of the world, and too many people without access to safe, efficient, and green transport. This stifles markets and hinders people from the jobs that will help them escape poverty. Without access to sustainable mobility, it will be much harder—if not impossible— to end poverty and achieve the Sustainable Development Goals (SDGs).